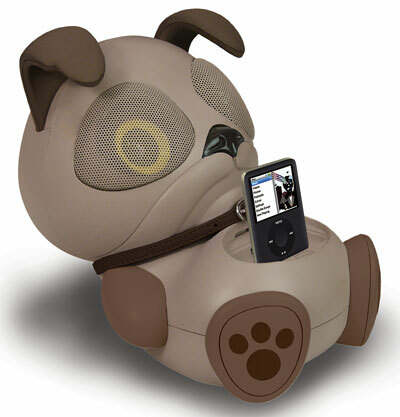 Electric Friends are cute animal-shaped charging stations and speakers for the iPod and iPhone. Not only are they adorable, but they produce really good sound. We tested out Sing Sing the Panda by playing everything from Mozart to The Muppets soundtrack and the quality of audio output was excellent. The sound was impressive at quieter levels and wasn’t distorted even at louder volumes. The docking station is easy to set up, just place your iPhone or iPod into the Electric Friend which can operate on 4 AA batteries or while plugged into the wall, and then press play. What I loved about Electric Friends is that volume is controlled by touching the ears (the left ear lowers the volume, the right raises it). So it’s easy enough for a pre-schooler to lower the volume when you announce that you have a phone call to make. Electric Friends would be a great addition to a kids’ room, and a conveniently cute addition to a nursery. Because the volume is touch-activated on the ears, it’s easy and accessible to lower the lullabies with an elbow swipe or toe tap if your hands are full rocking a baby. Electric Friends from Noetic, Inc come in four animal shapes: Chew Chew the Dog, Sing Sing the Panda, Ki Ki the Cat, and Kwack Kwack the Duck and are available through Amazon starting at $61.17. I added some links at the end of the story for where you can buy on Amazon. But be careful with the pricing. For some models, vendors are charging way above retail.